As a participant in the Captain Morgan’s Spice Up the Holidays Contest, I was charged with -among other things- developing three recipes (a cocktail, an appetizer, and a dessert) featuring either Captain Morgan’s Original Spiced Rum or their Black Spiced Rum to serve at a party. My first recipe was the Dark & Stormy Orchard; an appley twist on the classic combination of dark rum and ginger beer. When it came time to make an appetizer, I knew EXACTLY what I wanted. This girl wanted jerk chicken. I’m assuming most of you are familiar with jerk chicken whether or not you’ve tried it. This Jamaican spa treatment for chicken is a total flavour explosion. If you’ve not had or heard of it, let me assure you that it doesn’t involve finding a badly behaved bird, although if you’re so inclined, I have a really foul (fowl pun alert) tempered rooster I’d volunteer for the job. Jerk seasoning is a complex tasting combination of spices and aromatics. There are both dry-rubs and wet marinades, but both usually have a mixture of green onions, ginger, cinnamon, allspice, nutmeg, black pepper, thyme and habanero peppers. The wet marinade usually adds vinegar, lime juice and rum to the mix . I prefer the punch of flavour that goes all the way through the meat with wet marinades. Dry jerk seasonings and wet marinades can usually be purchased in the store, but I prefer mixing my own because I can control every single nuance of spice that goes into it. I like my jerk seasoning heavy on onion and a little lighter on allspice and nutmeg than is usually found in dry mixes. And since I also prefer a wet marinade, my blender makes quick work of making the marinade. In my first Spice Up the Holidays post, I asked for your best entertaining tips. Wow! You all are GOOD! The decor is what was daunting me the most, being the sort of girl who piles rocks she collects on her table, puts reading glasses and a hat on her bust of Beethoven and calls it good enough. You guys made it sound less frightful, so thank you! I do believe I’m going to have a gorgeous table. Also sharing tips was our judge for the contest, Chef Spike Mendelsohn himself. Yes, I got to chat up Spike! I did it from my freezing van in the parking lot at the church where I was about to teach cooking class. The point was this, Spike had some fabulous ideas to share with me. He said that aside from dancing on the tables, he liked to liven parties up by making them interactive. He likes to ask his guests to bring a dish to share and have everyone get involved while at his house. Conversation can’t help but be easy when you’re all working together to produce a meal you’ll share. You’re an angel, Spike. Thank you! 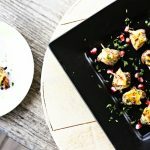 Jerk Chicken Bites are the perfect party appetizer because they can be done entirely ahead of time (minus the garnish) leaving you more time to mingle with your guests. You can have these out to nibble while you’re all putting your meal together. Nothing sparks hunger like being around food, so if you’re going to put your friends to work with you, it’d be awfully nice for you to take the edge off. They’re good hot, warm and room temperature, but I doubt they’ll last long enough to get much cooler than warm. 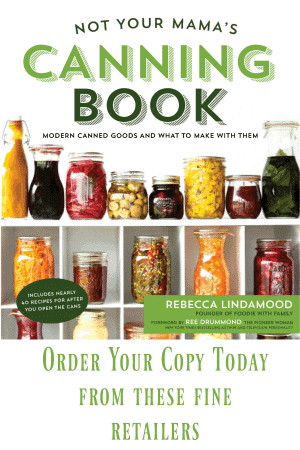 The recipe can be doubled or tripled easily and yields a large amount for a small cost. I chose to cook mine on the grill in a more traditional approach, but if you don’t have (or don’t like using) a grill, you can cook the chicken under the broiler or in a frying pan on the stove top. The stove top yields a pretty splattery mess on the stove top but a moister final product. If you’re invited to a holiday party this season and asked to bring a dish to pass, I guarantee you’ll get more oohs and aahs than you know what to do if you show up with a plate full of this. No parties? No problem, make yourself a plate, eat ’em in your yoga pants and congratulate yourself on not having to go anywhere. Either way, you win big. 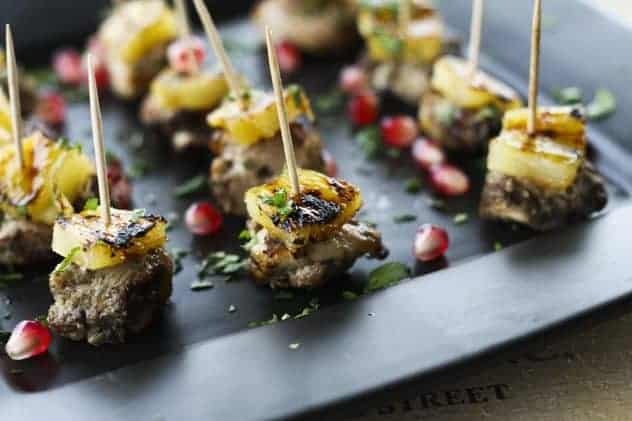 This simple but stunning appetizer of juicy, spicy, Jerk Chicken Bites is topped with grilled, caramelized Rum Glazed Pineapple. This gorgeous dish will be a hit for any party and is easily scaled up to feed more. Add all ingredients EXCEPT the chicken thighs to a blender and blend until mostly smooth. Cut the chicken into 1-inch cubes and add to a resealable zipper top bag. Pour over the chicken in the bag. Squeeze as much air out as you can and marinate the chicken in the refrigerator overnight or at least 8 hours. Soak a handful of wooden skewers in warm water for 30 minutes while preparing the grill and chicken. Heat a gas grill on HIGH or build a hot bed of coals to one side in a charcoal grill. Thread the chicken onto the skewers taking care not to crowd them. Grill them over direct heat on an oiled grill for 3- 4 minutes before turning them. Flip them sooner if they're cooking too quickly. Cook on the second side for 3-4 minutes. Continue cooking and turning, trying to get colour all over the chicken as long as necessary to cook through to 165°F internally, about 2 minutes. Transfer the skewers to a clean plate and let rest while preparing the pineapple. Soak a handful of wooden skewers in warm water for 30 minutes while preparing the broiler pan and chicken. Lightly spray a broiler pan with non-stick cooking spray. Thread the chicken onto skewers, taking care not to crowd them. Line them up on the broiler pan and cook 5 inches under the broiler, for about 6 minutes per side or until chicken cubes measure 165°F internally. Add just enough canola or olive oil to coat the bottom of a non-stick pan. Drain as much marinade off of the chicken as possible. Cook the chicken over medium high heat, flipping frequently, for 6-8 minutes or until has taken on colour all over and measures 165°F internally. Take care as the oil will spatter because of the marinade. Pour the pineapple juice from the can into a saucepan. Add the brown sugar, rum, jalapeño, and cider vinegar to the pan. Bring to a boil then reduce heat and simmer for 5 minutes. In a separate small bowl, whisk together the cornstarch and ginger beer or ginger ale. Whisk this into the simmering juice mixture and bring to a boil, stirring constantly. Lower the heat and let the mixture simmer for 1 minute, then remove from the heat and stir in the lime zest. Brush the pineapple slices with oil and sprinkle lightly with salt. Space them on the hot grill (or on a hot, oiled grill pan). Flip them when they have grill marks on the first side. Brush with the glaze and let it cook on the second side until that too has grill marks. Flip the pineapple again and brush generously with more glaze. When the first side has caramelized a bit (has some small blackened areas and is sticky to the touch) flip it and caramelize the second side. When that side is also sticky to the touch, transfer the pineapple slices to a cutting board, cut into pieces that are roughly equal to the size of your jerk chicken bites. You can save the additional glaze to use as a dip at the table, if you wish! Remove the chicken from the skewers (if they were used.) Skewer one piece of Rum Glazed Pineapple on top of each Jerk Chicken Bites with a toothpick. Arrange them on a platter and sprinkle, if desired, with pomegranate arils and chopped cilantro. Enjoy! Remember my big old rummy dessert is coming next week. You REALLY don’t want to miss it. Trust me. Oh, trust me. And also, please remember to check out my fellow contestants gorgeous offerings! Disclosure: I am a participant in the Spice Up the Holidays contest sponsored by Captain Morgan USA. I received products to use in my recipe development and compensation for additional ingredients but all opinions are my own. 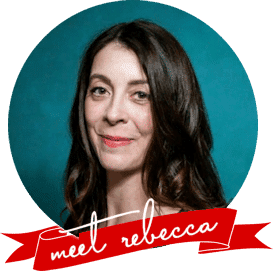 Rebecca, these are going to be perfect with your cocktail. Wish I were there for my fill! The wrap up posts I think are going to be awesome and very inspiring. I think Captain Morgan sure did pick a dandy group of gals! Thanks, Robin! I can’t wait to see how everyone’s parties go. This is such a fun event Captain Morgan is putting on with us. Oh my gosh girl, these look amazing!!! Haha, great minds think alike too! I love that both our appetizers have a pineapple on them! I think I need to make these soon! Indeedy! Pineapple was where my brain immediately went! How fun is that? These are so fantastic! love that pineapple! Jerk is one of my favorite flavors and this presentation idea ROCKS!!!! Party starting indeed. Oh wow I need to come to a party at your place. These look phenomenal. I can almost smell them in the pictures! Made these for NYE and they were a total hit! I did make one addition, adding a dipping sauce made from crushed pineapple and a reduction of the glaze ingredients with a little more rum added. Will defininitely be making these again! That sounds outstanding, Wayde! I love the dipping sauce idea! Could you tell me how many bites this recipe makes? Thanks! I’m afraid I don’t have the notes on how many it yields, Carey. There is a range of quantities given for the chicken, though, so you should be able to adjust how many or how few bites you’d like to have on hand. If you’re looking to minimize any waste, just assemble as many bites as you’d like after preparing the chicken. The leftover pieces of chicken would be good tossed in with pasta! I am making these for an engagement party this weekend. You said they can be made ahead?? Like day before and reheat? Also, how would you prepare the pineapple under the broiler if not using grill. Hey Suzanne- I would be totally fine with making them a day ahead and reheating. As for preparing the pineapple, the broiler sounds lovely, too… Or you could use a screaming hot cast iron pan!